When you stay at Sand Dunes Resort and Suites in Myrtle Beach, you'll be on the beach, within a 15-minute drive of Ripley's Aquarium and Broadway at the Beach. 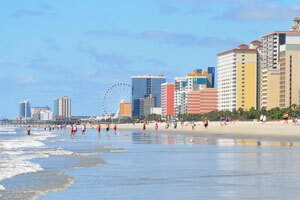 This beach resort is 5.4 mi (8.7 km) from SkyWheel Myrtle Beach and 6.4 mi (10.3 km) from Family Kingdom Amusement Park. Make yourself at home in one of the 250 air-conditioned rooms featuring refrigerators and microwaves. Rooms have private balconies. Complimentary wireless Internet access is available to keep you connected. Private bathrooms with shower/tub combinations feature complimentary toiletries and hair dryers. Be sure to enjoy recreational amenities, including an outdoor pool, an indoor pool, and a fitness center. This resort also features complimentary wireless Internet access, an arcade/game room, and gift shops/newsstands. You can enjoy a meal at Mias Pizza & Subs serving the guests of Sand Dunes Resort and Suites, or stop in at the grocery/convenience store. Quench your thirst with your favorite drink at the bar/lounge. The preferred airport for Sand Dunes Resort and Suites is Myrtle Beach, SC (MYR). This property accepts credit cards with a chip only. For more details, please contact the property using the information on the reservation confirmation received after booking.